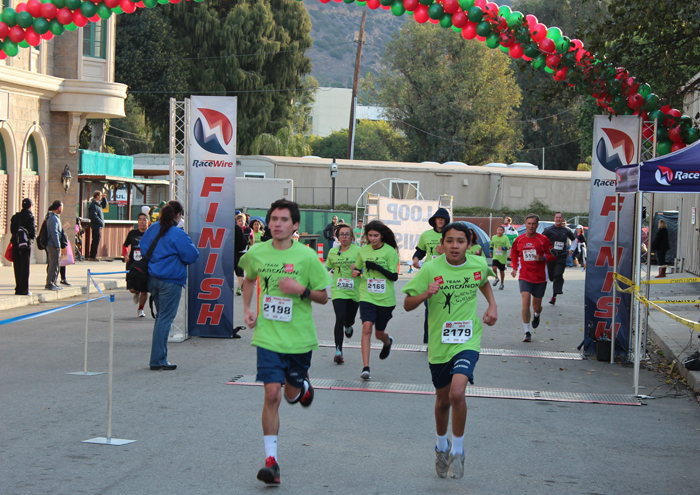 Hundreds of Team Narconon volunteer runners participated in this annual Hollywood Holiday Classic to help spread the drug-free message to youth, families and communities. This annual race is a great opportunity for kids to contribute by participating in a professional event with a strong drug-free message. Temperatures hovered close to freezing as 1,350 runners lined up in the Courthouse Square of Universal Studios Hollywood backlot, famously featured in the Back to the Future trilogy. When the starting signal was heard, volunteer runners began simultaneous 10K and 5K races on a course that would wind through world-renowned movie sets such as Bates Motel, ‘Psycho’ House, Jaws Lake, Little Mexico, New York Street, Whoville, and War of the Worlds, before finishing back in the Square. For these few hours on Sunday, December 8th, the focus of thousands of mostly young people was on delivering the message that life is better without drugs. 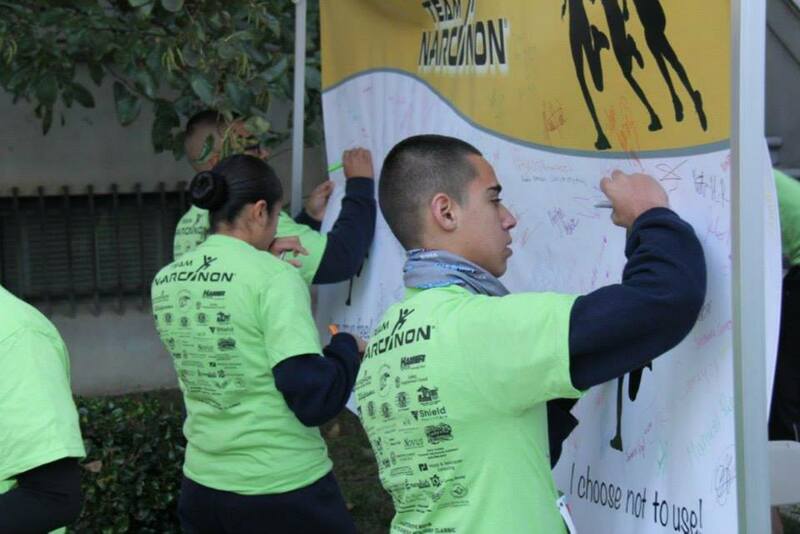 "Team Narconon" was almost 400 runners strong, composed of local youth, the youngest being six years old. Runners represented 50 Southern California cities such as Sylmar, Pacoima, Arleta, Van Nuys, West Hollywood, Los Angeles and Burbank. Narconon Drug Prevention & Education, Inc. awarded sponsorships to these young runners thanks to support from over 60 community businesses and individuals. "This annual race is a great opportunity for kids to contribute by participating in a professional event with a strong drug-free message," said Sigal Adini, executive director of Narconon Drug Prevention & Education. "Parents and teachers expressed to us over and over how much fun their kids had. For some this was the first time they ever got to participate in such an event." Officially, there were 473 runners in the 10K, 875 in the 5K race, and 1,022 runners in the 5K Fun Run/Walk. Add all the volunteers, family and community supporters and there were more than 3,000 people filling the town square in the chilly early Sunday morning. 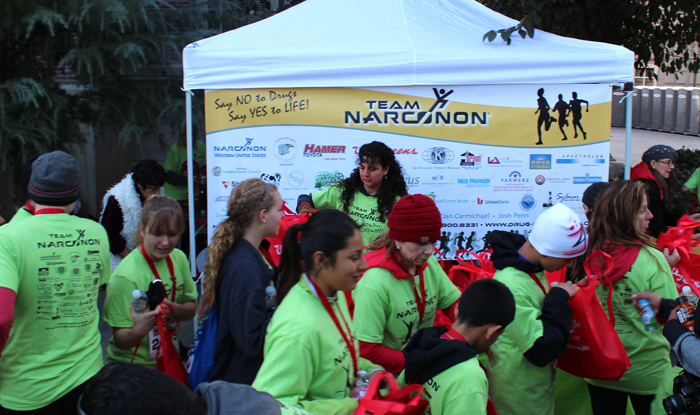 "Team Narconon" had 379 runners representing 6 high schools, LAPD volunteer groups, Boys and Girls Clubs, etc. One of the Team was Cristian Suarez from Arleta who placed second overall in the 10K run. To the applause of the entire crowd, he ascended the steps of the Gazebo in the middle of the square to receive his award. Team Narconon also had four other runners in the first ten to finish the 10K race. As the finishers mingled and chatted after the race, the bright green t-shirts of Team Narconon were everywhere. "I was using drugs, but with some help, I stopped. I want to tell other kids how bad it is to use drugs," said one teen in the Town Plaza. A teacher from Arleta commented, "It gives the kids a fun, drug-free and healthy activity to participate in, rather than watching television or playing video games." "Sigal has done a commendable job in sponsoring this year's team. And it is more than twice the size of last year's!" said Clark Carr, president of Narconon International. Pointing to a Team Narconon banner which had messages like 'I Believe in Myself!' and 'I Choose Not to Use,' Carr continued, "An important part of the job of eliminating drug abuse is forwarding crystal clear messages like these to our youth. When parents and kids, families and professionals work and play shoulder-to-shoulder like this, we can bring down the numbers of those using drugs and struggling with addiction." For more information on Narconon International, call 1-800-775-8750.